Electromagnetic fields have complex and possibly harmful effects on the valuable brown crab, explains this article from Hakai Magazine. Over the past 10 years, Scotland has installed thousands of offshore wind turbines in the North Sea and is starting to deploy marine energy devices that generate power from tides and waves. It’s a green energy push that is slowly being replicated in coastal areas the world over. Though these installations are reducing coastal threats such as oil spills, they have the potential to cause other, more subtle, problems for marine life. From each offshore wind and tidal turbine, power cables snake to shore, connecting to power banks, converters, and the wider electrical grid. But these electrified cables could have odd and unexpected effects on seafloor life. According to new research, these electrical cables may be upsetting the behavior of the commercially valuable brown crab, otherwise known as the edible crab. Kevin Scott, a marine biology doctoral candidate at Heriot-Watt University in Scotland, is concerned about the potential cumulative effects of electromagnetic fields on marine life. 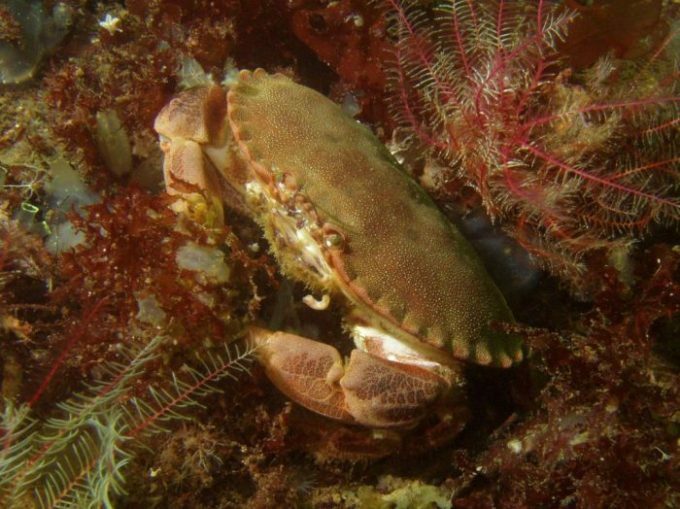 In recent research, Scott and his colleagues at the St. Abbs Marine Station on the Scottish coast obtained dozens of crabs from local fishermen and exposed them to electromagnetic fields in the lab. The fields didn’t directly harm the animals; physiological responses such as respiration rate remained normal, for instance. However, the fields had a distinct effect on the crabs’ behavior. Upon being exposed to electromagnetic fields, the crabs stopped what they were doing and were attracted to the plastic containers housing the equipment that generated the electromagnetic field, replicating what a power cable would do in the ocean. This distracting effect occurred roughly 70 percent of the time, while the crabs mostly ignored similar containers without electromagnetic fields. Scott says the research suggests that if crabs are similarly distracted in the wild—drawn toward the electromagnetic fields stemming from subsea power cables—they might forgo their usual feeding, mating, and shelter-finding activities. Electromagnetic fields dissipate within a few meters of power cables, so an animal would have to be close by to be affected. But Scott believes the effect could add up, especially for crabs that are tending eggs, which they can do for months at a time in the same spot. Cladding cables with metal sheaths only stops the emitted electrical fields, not the magnetic ones. And burying the cables just moves the problem to the habitat of organisms living in the seafloor sediment. 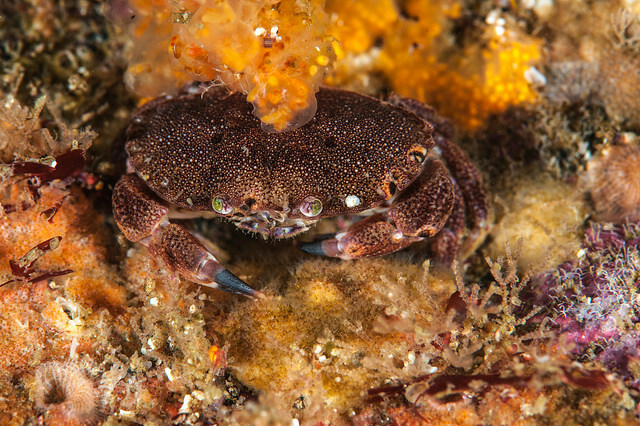 He says the effects of electromagnetic fields need to be studied further, before more subsea power cables are deployed, potentially threatening key commercial species such as the brown crab. 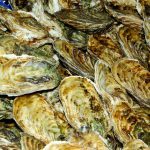 Andrew Gill, an environmental consultant formerly at Cranfield University in England who was not involved in the new research, says the problem may go beyond brown crabs. “There’s a huge number of organisms, from bacteria to whales, that apparently use Earth’s magnetic fields for movement,” Gill says. Caribbean spiny lobsters use magnetic fields to guide their long-distance migration, he says. When they are subjected to magnetic pulses they get disoriented and change direction. Sharks, rays, and skates also appear to sense electromagnetic fields, although it’s not yet clear whether subsea power cables would bother them. Yet Gill thinks Scott and his colleagues may be overstating the threat. “They’ve shown that there’s an effect, but they’ve gone too far saying it’s something to worry about with marine energy,” he says. “If one bird flies into a turbine, for example, is it something to worry about? More birds fly into glass buildings,” says Gill. But the research, he says, shows that the potential effects of subsea power cables warrant further scrutiny. Recent research by Milton Love and Mary Nishimoto, biologists at the University of California, Santa Barbara, adds more nuance to the field of study. The pair have examined the effects of electromagnetic fields on rock crabs in California’s Santa Barbara Channel and Dungeness crabs near the San Juan Islands in Washington State, and unlike Scott and his colleagues, they found no effect on the crabs’ behavior. Nishimoto cautions that it’s difficult to compare experiments with different methods and species, but she welcomes new experiments, especially more fieldwork and real-world observations. Scott appreciates the benefits of these field experiments, but he says tests in the lab allowed him and his team to control other variables that could make a difference, such as the presence of predators and prey, noise, weather, sea state, and changes in salinity. They’re now performing lab experiments to study whether the offspring of brown crabs and European lobsters incubated in the vicinity of electromagnetic fields are affected. Scott doesn’t think the offshore energy industry is sufficiently considering the complex and subtle effects it may be having on such valuable wildlife, including how it will impact the well-established fishing industry. Livelihoods that go back hundreds of years are going to be potentially affected by this, he says. This article was originally posted as Brown Crabs Are Attracted to Undersea Power Cables at Hakai Magazine on 30/07/2018.